Ouch! these sharp spikes are like the needles of a porcupine shaped in a sphere. I've seen them swaying on bare sycamore trees down the street and imagined a medieval knight doing the same. He must have gotten the idea that these spiked balls could come in handy as weapons for combat. Why not? A spiked metal ball at the end of a chain will crack the armor and shield of enemies in battle. Or perhaps win him a princess in one of those jousting tournaments. How strange something beautiful, a fruit from nature which the sycamore uses to disperse its seeds for propagation winds up as an instrument of war. I thought this spiked metallic ball is called mace but they are really flails it's what ails this world weapons of small and mass destruction. On the day when I first noticed these flail balls on the bare sycamores, white plum blossoms were blooming opposite of them. I paused between these trees of black and white as if I'm in the midst of war and peace. Suddenly, Pierre's dream vision came to me on the battlefield amidst the wounded and dying, he saw this globe as a living quivering ball with harmony in nature and the cosmos. 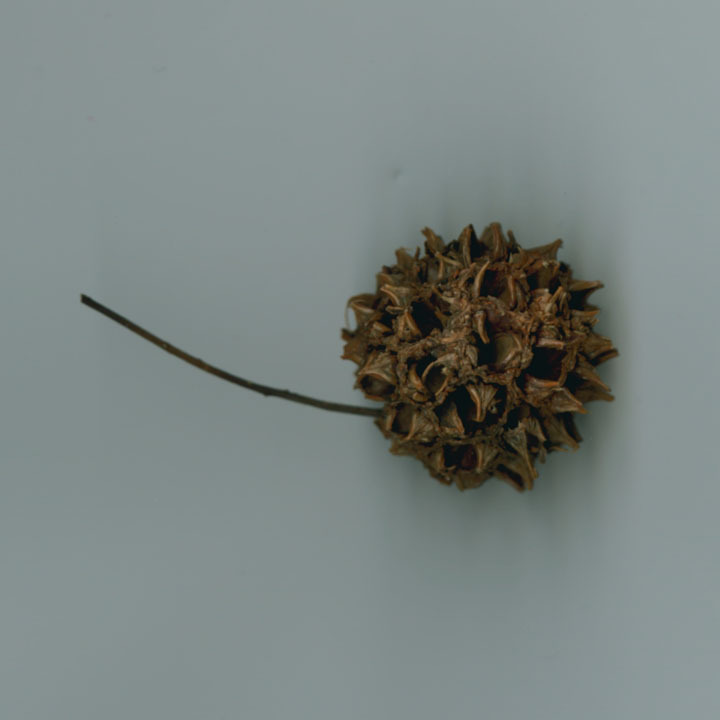 So today, this spiked sycamore seed ball which propelled me to the killing fields in medieval combat also lifted my mind up to the joy of consciousness and to the stars. Stanford students from nature objects he brought to class.